Things You Can Do at Camp That You Can’t Do at Home: Awesome Activities! Zipline – A 480 ft. ride that you take after leaving our 40 ft. climbing tower. The Blob – A huge inflatable water launcher that sends kids soaring into the air. Gaga Ball – Be the last one in the ring while getting others out by hitting them in the legs with a ball. Archery – Try to get a bullseye in one of the many targets at our archery range. Initiatives – Bond your group together with our 10+ team building initiatives. Paintball – Can you hit all your friends before getting hit yourself? 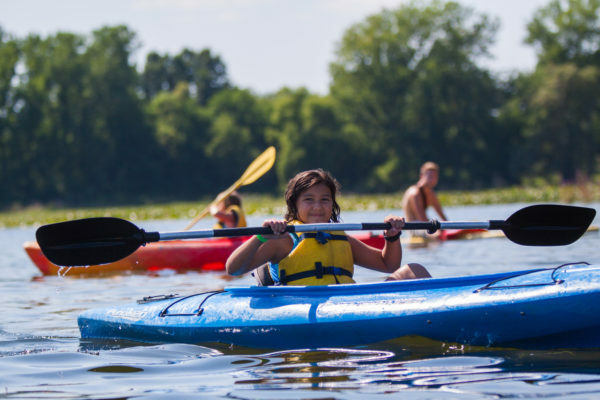 Small Boats – Kayak or canoe on our beautiful Bankson Lake! Tubing – See if you can hold onto the tube while being driven around the lake. Disc Golf – Bet you can’t get a hole in one on our 18 hole course! Large Group Games – A staple of summer camp including Gold Rush and Hunger Games. To see more activities that we offer or to register and try some of these out for yourself head to www.miraclecamp.com!